Led Zeppelin have begged the judge to halt their plagiarism trial. The band have been accused of stealing the intro to their classic rock song 'Stairway to Heaven' from Spirit's 'Taurus' but the group's lawyer have urged the judge to stop the case - brought by Michael Skidmore, a trustee for the late Spirit guitarist Randy California - because the plaintiff has so far failed to establish burden of proof during the three days of testimony. According to NME magazine, Led Zeppelin's lawyer Peter J. Anderson said: "Although the parties' pre-trial filings identified what plaintiff Michael Skidmore needed to prove to establish his claims, Skidmore failed to prove required elements of his claims for direct, contributory and vicarious copyright infringement." The group - which was comprised of Jimmy Page, Robert Plant, John Paul Jones and the late John Bonham - have been accused of lifting the music from the 1968 instrumental track for their own song, which they co-wrote and released in 1971. However, Jimmy has denied him and his former band mate Robert penned the classic rock song after hearing 'Taurus'. Appearing in court last week, the 72-year-old guitarist said: "Something like that would stick in my mind. It was totally alien to me." However, Page did admit that he owned three Spirit albums and that Led Zeppelin used a riff from another of the band's track in a medley played during their first tour of Scandinavia. Led Zeppelin's Robert and John are also due to give evidence, although the bassist didn't help pen 'Stairway To Heaven'. Meanwhile, the estate of Randy, who drowned in Hawaii in 1997 trying to save his 12-year-old son from a rip current, want him to be given a writing credit on the track and share of royalties. Shortly before he died at the age of 45, Randy told Listener magazine he believed 'Stairway To Heaven' was a "rip-off" of his own track with Jimmy and Robert regularly hearing 'Taurus' when Spirit supported Led Zeppelin in 1968 and 1969. "It's a sore point with me. Maybe someday their conscience will make them do something about it." Dame Shirley Bassey is being roped in to write a James Bond theme with vocal group Blake. Rihanna burst into tears on stage at Dublin's Aviva Stadium on Tuesday (21.06.16) after arriving 30 minutes late to her concert. 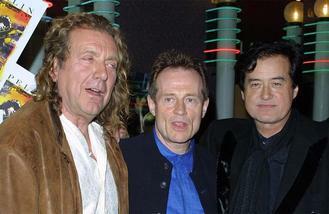 Led Zeppelin's Robert Plant has claimed he doesn't remember meeting the band he's been accused of copying. Massive Attack are to be honoured at the Nordoff Robbins O2 Silver Clef Awards. Slipknot drummer Joey Jordison was fired from the band by a "stupid f**king email". Donatella Versace played an unreleased song by Prince at her fashion house's Men's SS17 show at the weekend. Simon Cowell is reportedly "desperate" to take charge of the Spice Girls comeback album.